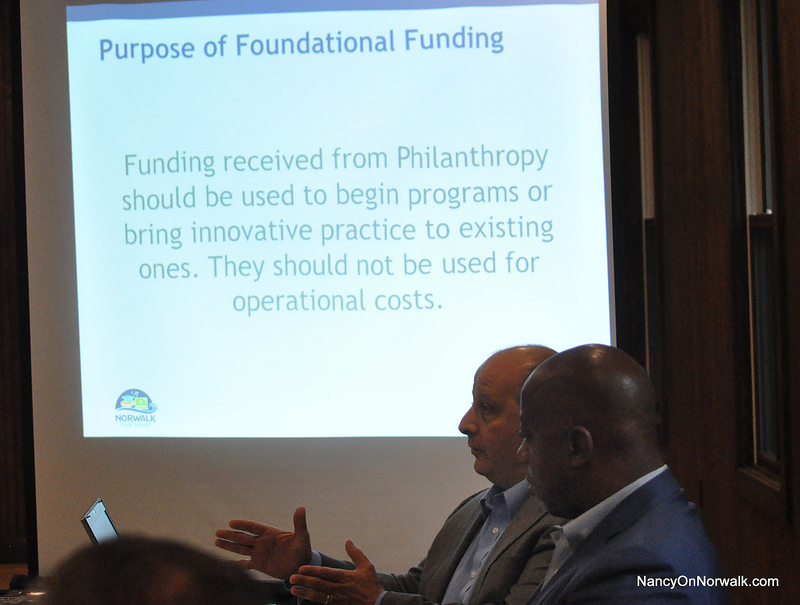 Norwalk Public Schools Chief of Technology, Innovations and Partnerships Ralph Valenzisi, left, explains the purposes of foundation funding Friday in the Cranbury Park bunkhouse as Michael Chambers of the Heidenreich Family Foundation listens. NORWALK, Conn. — A charitable foundation’s interest in helping Norwalk Public Schools elicited tears of joy Friday at the Board of Ed’s annual retreat. “When we sat as a foundation and we talked about where we could make a difference, it was easy to settle here on Norwalk,” Michael Chambers of the Greenwich-based Heidenreich Family Foundation told Board members. Chambers said that 42 funders met with NPS in May and became excited about supporting efforts to create groundbreaking programs here. “I am sitting here in tears because you are a prayer answered,” Board of Education member Barbara Meyer-Mitchell commented. Chambers said “it was very clear that Norwalk was place to be,” in part because, “We had a strong superintendent (in Norwalk) with a strong Board of Education around him, we had strong stakeholders here in the community that were getting positive results,” Chambers said. One result is a commitment from an unnamed foundation to provide $1.4 million of the $3.6 million needed for a three-year experiment, with the goal of winning a state designation as a School of Distinction for a school population with a majority of high-needs students. Pupils are considered high-needs if they are learning English, have special needs, are on free or reduced lunch, or are considered at-risk of educational failure under standards set by U.S. Department of Education. Last year Rowayton Elementary School was named a School of Distinction in spite of 45 percent of its students having high needs. Other Connecticut Schools of Distinction have had at most 20 percent high-needs students, Norwalk Superintendent of Schools Steven Adamowski said. Rowayton’s achievement inspired foundation interest in creating a School of Distinction in Norwalk with more than 50 percent high-needs students. Once enough grant money is obtained to reach the $3.6 million needed, certain schools would apply for the opportunity, Chief of Technology, Innovations and Partnerships Ralph Valenzisi said. The goal will be a model that can be replicated elsewhere. “My goal is to find and engage funders and say here are needs that the district has. Will you stand next to us and help us fund those needs?” Chambers said. Chambers spoke of the importance of an afterschool component and said Heidenreich has a small pilot program in Greenwich, teaming social workers with educators, that it hopes to bring to Norwalk. The first two are the umbrella at the high-school level that supersedes everything, and the other three involve preparation in lower grades to make sure that students are well-prepared, Valenzisi said. “We want to make sure high school students have opportunities to understand what it’s like to work in a work environment. We want to make sure that they’re actually being paid,” Valenzisi said. Norwalk High School’s first partner is the City Hall newsstand, which will be run by students in the transition program three or four weeks from now, he said. The newsstand is a job site for the NHS culinary arts program and JB’s Deli is the partner. Other opportunities will be in place by next summer, Valenzisi said. The idea is that everyone who graduates from a Norwalk high school will either be ready to go to college, enter the workforce or join the military. Heidenreich has provided $51,000 to develop a marine science pathway at Brien McMahon High School, where students will either earn a pilot’s certificate or be made ready to enter a merchant marine academy, Valensizi said. The pathway will be developed this year. The Dalio Foundation originally funded the entire cost of Teach to One at Nathan Hale, but the funding has been reduced every year by 30 percent to make the program sustainable, Adamowksi said. This is also the plan as it is implemented in other schools. There’s a need for Alegbra interventions at Norwalk High, and Teach to One will be implemented there, Valenzisi said. It’s important to realize that grant funding will not supplant operating budget costs, he said. Great news about foundation interest in NPS though not sure “foundational” is correct/best word (check out definition online). And while we’re wordsmithing what’s wrong with “operating” (vs “operational”) costs? “Supplement not supplant” the simple way funders often talk about outside $. Given one foundation’s interest in after school programs, maybe helpful to pull out Mary Peniston’s files full of research-based best practice? Frequent leadership turnover over the years takes its toll on sustainability of things worth keeping.. The comment above by “Pros & Cons” relates to slide five of the PowerPoint linked at the end of the story. Mary Peniston’s grant applications never got funded. The after school program that was approved and funded came from the grants office at the time. I believe that model was a model for the state department. That’s the one the Board should research. While this is good news, the constant push and pull between struggling homeowners straddled with perennial higher taxes and the insatiable appetite for higher BOE funding due to lower state funding/union obligations/integrating and defacto parenting large 3rd and 4th world immigrant students will be ever so defining in the years to come. Will Norwalk devolve into the ash-bin of urban decay similar to other CT metropolises (Bridgeport, New Haven, Hartford, and Waterbury) or will the city somehow lead by example any look for innovative measures to control municipal costs? Norwalk’s fiscal path is clearly unsustainable yet elected leaders brag about the city’s “wonderful” growth which so far has chased many long-term residents and continues to place burdens by placing higher and higher mill rates year in and year out. Is the city’s “growth” advertised a malignancy metastasizing or will Norwalk finally get its fiscal house in order in line with the modest incomes its citizens can afford? One has to wonder.